Learn from dynamic, national and international leaders in the field of inclusion and self advocacy by attending on-line or in person the Partners in Policymaking Speaker Series. These exciting speakers will provide you with a great education if you are looking to expand understanding and your tools to be a positive force for people with disabilities in the world. Click here to see the whole series. The cost is free for Partners Graduates and only $25 for the entire series. Very well worth it! 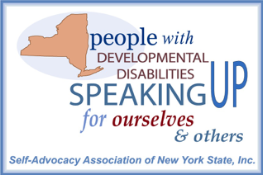 Copyright © 2018 Self-Advocacy Association of NYS, All rights reserved. Thanks for being part of the self-advocacy movement. People with developmental disabilities speaking up for themselves and others!